Smoking a beef brisket is no easy task if you have never tried it before. Every step from shopping for the right cut to how you lay the beef brisket on the smoker is important to the outcome and the taste of this recipe. Even if you are a first timer, this recipe will provide you the directions you need to smoke a tender brisket while still looking like a professional. 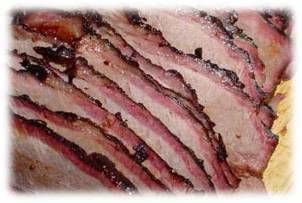 Brisket is known for being a very tender piece of meat that can melt in your mouth. It may surprise you that brisket is an extremely fatty portion of the cow when you are looking at an uncooked one at a grocery store. This is one of the only times when you actually want to purchase a cut of meat with a lot of fat. Brisket is about $3-4 a pound and it should have marbled fat throughout the meat with a solid top layer of fat. This fatty top layer will actually melt down during the smoking process and tenderize the meat. However, the brisket fat will not completely melt and cook out while smoking, so you will need to still trim the fat after it is done. Start by emerging your wood chips in water or beer an hour to two before you want to put your brisket on the smoker. Soaking these wood chips will make them smoke instead of burn. Light your charcoal smoker approximately 30 to 35 minutes in advance of putting your brisket on. You will know that your charcoal is ready when all of the coals turn from black to a glowing white ash color. If you have a gas grill, prepare it for indirect grilling by making sure your burners are not directly under the brisket. Start preparing your beef brisket by cutting small slits about an inch apart in the top fat of the brisket to allow the rub to penetrate the inside of the meat. This is a process called scoring the beef brisket. Next, rub your mustard all over the outside of the beef brisket. Make sure to fully coat the meat and inside some of the cracks that you cut during the scoring process. Then sprinkle your barbecue seasoning or rub all over the outside of the meat. Do not be afraid to use a lot of seasoning as you want to make sure the brisket is fully coated all the way around. Put your brisket on the grill with the fat side up! This is extremely important and can ruin your brisket if your white fat is turned down because the melting fat will not baste the meat. Your brisket will turn out tough and will be a waste of time and money. Baste the smoked beef brisket with the mop sauce every hour starting two hours into the smoking process to help maintain moisture in the meat. You ideally want to use a BBQ mop that looks like an actual miniature mop and not a brush to apply the mop sauce. If you use a brush it will tend to wipe the seasoning off the top of the meat instead of gently applying the sauce on top of the seasoning. Check the smoked beef brisket's internal temperature every hour after it has been on the smoker for 5 hours. You are looking for an internal temperature of about 185 degrees Farenheit before you can take it off the smoker. With certain smokers it may be hard to reach this internal temperature because your heat source is far away from the brisket. If this is the case, you can always wrap your brisket in aluminum foil or finish your brisket for the 45 minutes to an hour in the oven at 250 degrees. Never cut into any meat straight off the grill or off the oven while it is still hot. You want to let your beef brisket sit for 30 minutes wrapped with a tent of aluminum foil. The brisket will continue to cook and then eventually cool down before you take a blade to the meat. This is important because the juices will redistribute throughout the entire brisket during this time, but if you cut into it too early it will stop this process and make the meat tough. Always slice your beef brisket against the grain of the meat. 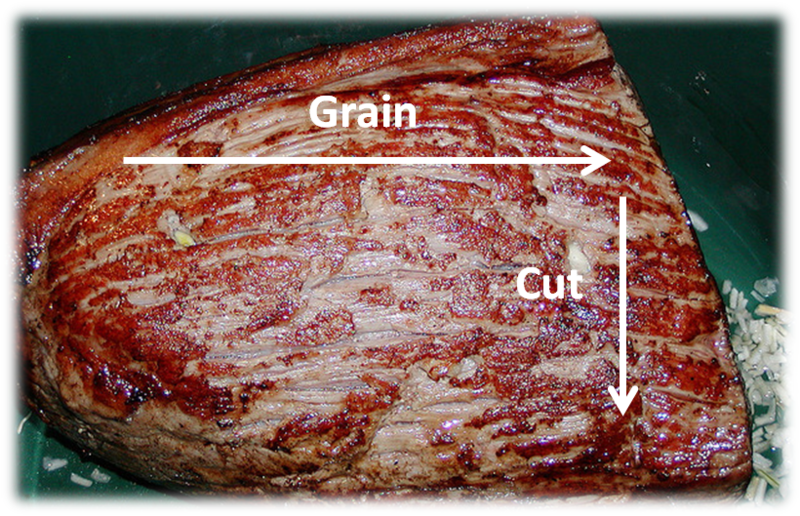 If you slice it in the same direction as the grain, the meat will not be as tender. You can tell what the grain is by looking at the lines that all go in one direction across your brisket. Did Your Brisket Turn Out Tough? If your brisket turned out tough or not as tender as you would like, there is something you can try as a last resort in order to tenderize the meat. Usually this situation happens when you didn't smoke the brisket long enough. Simply slice your brisket and drop it in a crock pot for 2 hours with barbecue sauce. This will continue the cooking process and the barbecue sauce will add moisture to help tenderize the brisket. If this doesn't work, you may have just bought a bad piece of meat or cut into the brisket too quickly after you pulled it off the smoker. Beef brisket should be cooked low and slow at about 225-250 degrees Fahrenheit. At this temperature, you should expect to cook your brisket for about an hour to an hour and 15 minutes per pound of brisket. Of course, these are just rough time estimates that will depend on many factors. Make sure you know how long to smoke your beef brisket by checking the temperature throughout the smoking process every couple hours. That is why it is best to purchase an instant read meat thermometer in order to check the internal temperature of the beef brisket throughout the smoking time. You are looking for a final internal temperature of about 185 degrees Fahrenheit for the brisket to be finished.